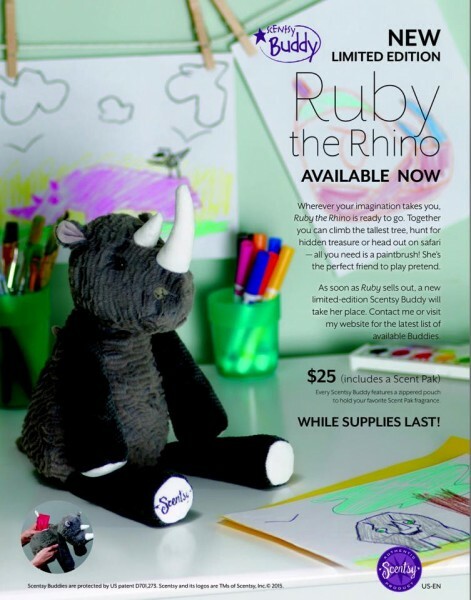 Scentsy Buddy Ruby Rhino is new to the Scentsy Buddy family! Wherever you imagination takes you, Ruby the Rhino is ready to go. Together you can climb the tallest tree, hunt for hidden treasure or head out on safari –all you need is a paintbrush! She’s the perfect friend to play pretend. As soon as Ruby sells out, a new limited-edition Scentsy Buddy will take her place. Scentsy Buddies are soft, squishy, SCENTED stuffed animals -the perfect gift for baby showers, birthdays, Easter, and of course room decor. Update: Scentsy Buddy Ruby Rhino has sold out! Visit my online Scentsy Store to shop our list of current available Scentsy Buddies. Scentsy Scent Pack included with each purchase of a Scentsy Buddy. Once on the website, you will select your favorite Scentsy Scent Pak. Choose from scents like Aussie Plum, Bananaberry, Blueberry Cheesecake, and Beach. It’s up to you on what scent you like best! Choose a Scentsy Scent Pak in one of over 80 available fragrances. Scentsy Buddy Ruby Rhino is available only while supplies last. As soon as Ruby sells out, a new limited- edition Scentsy Buddy will take his place.